You may have noticed that, although we announced the Munchkin Journal Pack 1 earlier in the month, we didn't announce the Munchkin Journal Pack 2. This isn't a mistake or an oversight on our part; the Munchkin Journal Pack 2 is a bit of a special case. Allow me to explain. 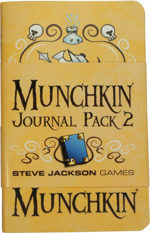 The Munchkin Journal Pack 1 will be available through normal channels. You'll be able to buy it from the same places you buy your copies of Munchkin, provided those retailers stock the Journal Pack 1. The Journal Pack 2 is going to be a little harder to come by. See, it's an exclusive reward for GAMA retailers. At the GAMA Trade Show this March, we're going to give six copies of the Munchkin Journal Pack 2 to every store attending the show. 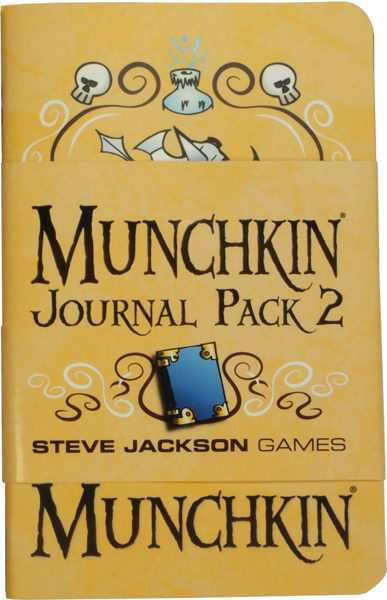 Further, any stores that are GAMA members by March 1st, 2014, but are not attending the show, will get one copy of the Munchkin Journal Pack 2. What does this mean for you, the fan? Well, if your FLGS is a GAMA retailer, you should be able to go in and pick up a copy of the Journal Pack 2 while supplies last! The best way to find out if your FLGS is a GAMA retailer is to ask them.